This series experiments with mechanically-driven drawing techniques, some in combination with work by hand, some entirely mechanical, but all performed with analog mediums and paper. This makes the series a new exploration for me and consequently this is a fairly long post. So, if you'd prefer to first view a selected works collection of the images you can do so here, and if you're interesting in acquiring them and/or viewing detail images not pictured in this blog, you can do so here. Granted, all of these are stanchions that when put together form much of the contour of both the analog and digital work I have done so far in life, but as a result of the work done so far in this series, all have been nudged in slightly varying directions and have faced new challenges in understanding. Portraiture has remained the least embarked upon direction in my art so far, and is the area that has, along with complexity and iteration, seen a bulk of the focus in direction that is included in this post. I'm interested in how our perceptions of others have shifted since digital portrayals have become the status quo. Whereas portraiture was once made through long sittings with paint, or increasingly shorter waiting periods to make a photo, now the subject's image is translated through a lens of some kind, encoded into bits, then decoded onto a screen or print form. My perceptions of most people I have seen but have never met are therefore not rooted in reality at all, but invisibly created in this transfer of information from one place to the next, more often than not experiencing a vast multiplication of existence, whether through a magazine, website, or Instagram. Consequently, the closer I tend to look at these portrayals, the further from that conception of their reality I go, as they vanish into an abstraction of approximated pixels or dot patterns. It is this invisible undercurrent that some of this work references and explores. Analogously, complexity and iteration have transformed through our ability to zoom, to replicate, to transform and combine complex systems. Even simple apps, such as those that merge photos into a collage or slideshow on our phones, perform a great deal of complex tasks that reside in subterfuge through their code. This series explores the ability to expand on inordinately meticulous tasks such as drawing perfectly concentric circles or performing overlapping patterns that, perhaps even with a very large amount of time and energy, would be elusive to artists before the advent of the machines in operation. The ability to reconcile these structures through unifying their undertaking with the same tools an artist may use by hand has had some surprising and perplexing effects, and this post will address some of those findings as well. As for optics and the analog / digital relationship, there is much that eludes me, being no more than a fan of both. But I will make some conjectures throughout that are based on the scarcity of things I know and the relation of those to the recognition of the mind-bogglingly endless pool of things for which I'm unaware. On January 30th, 2017 an eagerly-awaited box arrived on my doorstep and inside was my first art robot. At least, I call it an art robot. The company that makes it, Silhouette, named it the Cameo 3: an ultimate DIY machine for home crafting. This is a short post about the findings during the first two months of its new place in the studio and corresponding implications for future works. For the previous few months I had been searching online for an X-Y plotter that could use analog tools (such as common pens) to mechanically execute artistic concepts on traditional substrates, or more specifically, to augment processes through performing work with the same tools I use for hand-making art. Ideas that surrounded experimenting with and harnessing precision machines to mix processes with the human element were developing during studio work to the point of distraction, so when I came across the Cameo 3, I made the first step in that direction. I have another machine that I think is even more exciting on its way called the AxiDraw 3 (made by Mad Scientist Laboratories) but it will not arrive until late April; that's another story. I wasn't entirely sure what I would do with the Cameo but I was curious to experiment with trying to merge some of the computer-based imagery I tend to do while not painting or drawing with the capability of robotics. Beginning work with a consumer-grade machine seemed like a good initial step to start gaining an understanding of processes that were very unfamiliar. The language of digital conceptualism faces a bottleneck of diminishing returns depending on the medium of transfer; unless executed with the same or very similar level of exactness, the effectiveness and inherently powerful potential introduced at the shores of digital-to-analog works face limits imposed by the granularity of the analog environment, by the exponentially time-intensiveness of increasing the level of detail, or by a merciless combination of both. I'm speaking specifically about projection work in which detail ascends in complexity, and transfer work in which scale disproportionately counters feasibility. In order to communicate within the thin line of where by-hand work and mechanical work intersect and better explore the disparate straddling sides, using the same pens, pencils, or other media constitutes a much more desirable common ground, as comparison and collaboration take root in the same real world imperfections and the same idiosyncrasies of each media. My hope was that by eliminating as many differences as possible, akin to accents for second languages, the contrast between commonalities and differences would be in higher focus and consequently drive a course of work bound less by interferences in process and more by an as-large-as-possible congruency of process perceivable in the end results. The ability to use a physical pen in the process creates a rich variety of nuances such that even when the same process is executed twice the differences in results make each piece unique, and this variance is something that, though hugely multiplied when on a human scale, is something that allows the works done so far with the Cameo 3 to feel personally more welcoming to collaboration since they are imperfect in nature. Prior to the Cameo 3 arriving, I hadn't experimented with the software on which it runs, and the software itself is very specific in its relationship to the machine. 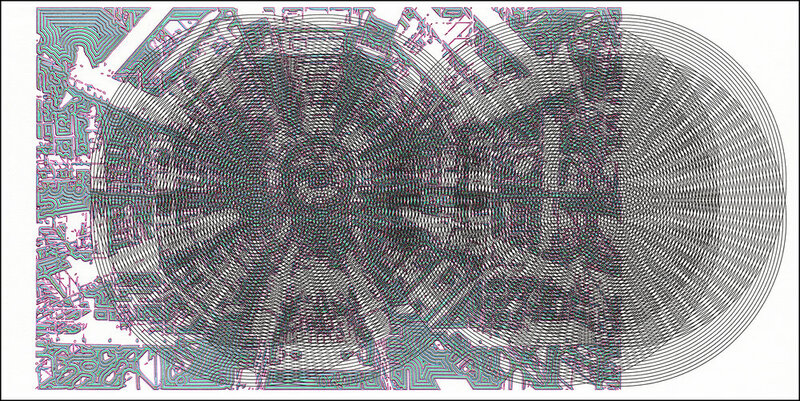 It is about as wide asunder from a program like Photoshop as anything I've encountered, since its primary function is to efficiently cut materials in the most sensical order that poses the least risk of disturbing the cut material; drawing with a pen, which would seem like a simple matter of laying out lines and executing them, soon became a real challenge of wrestling the software and learning the limits and upper bounds of how the machine reads the design. I'll spare you the details. But if you happen to be reading this by some chance of searching for answers about how to use the sketch pen functionality with the Cameo 3, feel free to reach out via the contact page; I'd be happy to help if I can. Mainly, my thought to import a scanned drawing I had done on paper and have the Cameo replicate it (even crudely) turned out to be a, well, nice but unrealistic one. I was hoping to harness this basic concept to begin iterating on originals, mirroring them, slicing, cutting and pasting; incorporating the benefits of digital techniques with physical works, or at least this was my first round of experiments to familiarize myself with the machine. 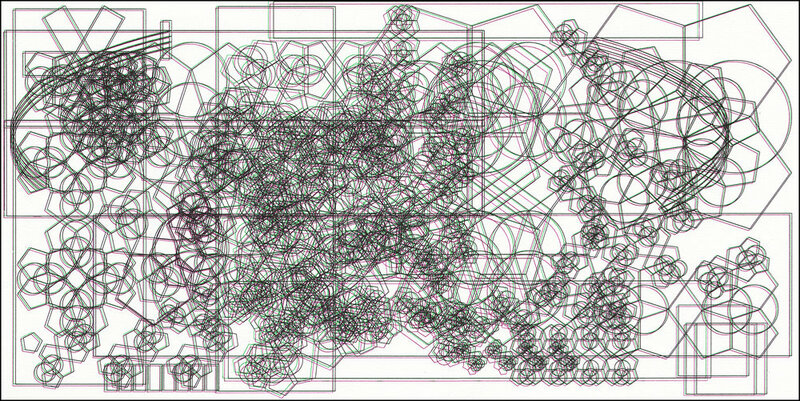 The software uses what is called the Trace feature, the function of which is to outline shapes to be cut, rather than interpret pixels and reconstitute lines; a bit of a blunder on my expectations, since when the software sets about to trace the interior spaces of my line drawings in the context of a PNG, it has to do so in a manner that excludes a large margin of the line work, thereby creating what appears similar to a stained glass patchwork of interior spaces. This is one example of the software's impressive abilities that just so happens to contradict on of my motives. But, as with anything, some workarounds emerged, and the following are chronological photos taken along the way as well as screen captures that chronicle how some of the pieces came to be that stem from this principle, its adaptations, and the others that followed. Through the many experiments which produced unexpected results along the way, I was able to reconcile most of the early frustrations and bypass some of the memory-specific limitations of the software, which during the first week or so seemed like dead-ends, and emerge with some works by which I am both pleased and perplexed. The progress continues, but before I embark on the upcoming Visiting Artist Program for the Williston Northampton School in Massachusetts in April, I thought this was a good point to take a breath, encapsulate what has occurred so far, and end with a note about where I consider this vein of work be heading. Though I can't include the hundreds of images amassed along the way that deal with process, I am going to attempt a series of pivotal moments that give a sense of direction taken due to both errors and successes. And this the Cameo at work on that early piece. One thing that surfaced very early on is the bizarre but systematically oriented way in which the machine performs the jobs. It takes quite a while to process beforehand, during which time I imagine it is calculating how to group 'cuts' such that it can make a continuous incision (line) without disturbing other adjacent cuts to be made that would be susceptible to otherwise tearing or turning into vulnerable islands. Consequently the way the pen moves was something I couldn't quite stop watching due to the non-linear progression, all the while trying to figure out why. Below is the second original drawing loaded and ready to be used as a test-bed for the Cameo line work, this time in the instance of a running horse (not pictured). Originally, these photos were intended to be a part of the transfer series I was doing at the time, but that's another story. You may notice that there's a slight inversion in value that occurs, most prominently in the hair portion. This is due to areas that are mainly positive space (black) in the image used to trace cuts being less sparse in actual ink marks than those that are more medium in tone and thus more uniformly marked and darker. But, back to the horse. Below is a line-halftone pattern I created to see whether or not the fidelity to spaces would convey a satisfactory semblance to the original image, and I decided to let the chance take place on the original second drawing. The above result is an instance in which two fairly intricate systems are able to coexist with both the same medium employed and also the same relationship to the surface on which they exist. This is an approach I've taken from the opposite vantage when trying to incorporate my improvised line work atop something corporeal, such as a horse, but either projected or drawn otherwise by hand. There are merits to both approaches, but I will say that trying to draw a horse atop an existing drawing of mine has tended to be restrictive by being both cumbersomely confusing and also vulnerable to an unwillingness to compromise some areas over others due to preference. The process can stall. Here though, there was no hesitation and the Cameo delivered a ghostly image of a running hose without any consideration for my feelings or preferences of certain areas on the drawing below. It is due to this automatic steamrolling above an existing work that makes this approach at once liberating and daunting, and I like that mixture. Below is an image of a work in progress on a 40 x 30" canvas, all by hand. It's a good example of what I mentioned above about the process of orchestrating my personally improvised line work on top of a silhouette of something more literal, and will appear once finished in a separate post, but there is something unique to the hand-done method that I think is complemented well by the robotic counterpart, and this is one of the components of doing work by hand and work in conjunction with the Cameo that yields a bit of deeper understanding as well as questions about the relationship between both. This is the conclusion of part 1. Part 2 and 3 will be out in May.